A former student of mine, James Donaldson, sent this postcard from Camp Arifjan in Kuwait. I first knew James when I taught Spanish in Greenville, Mississippi, right after college. He, and his now wife, Kira, played on the high school soccer team I coached there. I haven’t seen James since I left Mississippi in 2002, so it was great to get his postcard and know that he and his family were doing well. James joined the United States Marine Corps right after high school, and has proudly served at a variety of posts ever since. GySgt Donaldson tells us that Camp Arifjan is the “hottest place on earth.” I did a little checking, and found that the temperature there can climb as high as 124F! Sounds pretty hot to me. 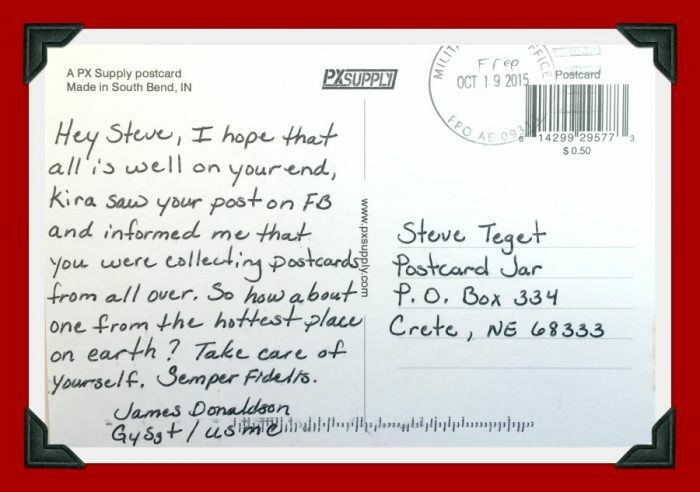 We’d like to thank GySgt Donaldson for taking the time and effort to send us a postcard, but more importantly, for his unwavering service to our country. You are a good man, James, and I’m so proud to know you. Be well.